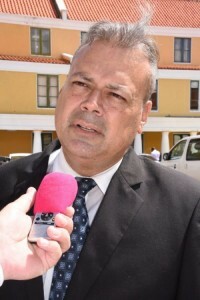 WILLEMSTAD – Members of the Supreme Electoral Council (SEC) had a meeting today with the new Minister of Government Services, Norberto Ribeiro. The minister believes that the members of the SEC should recognize him as a competent authority and therefore should heed his instruction to suspend all preparations for the elections of April 28th. If not, then it can be understood, according to Ribeiro, as a work refusal. Last night Charles Do Rego, a member of the SEC told the media that he has learned from reliable sources that the members will be dismissed if they do not respond to Ribeiro and do not accept the authority of the Minister. President of the SEC Randolph Römer said yesterday, after the meeting with Ribeiro and the Council of Ministers, the SEC will simply continue with its preparations for the elections. He said that the CES will cease operations only after they have received a National Decree signed by the Governor indicates that the current National Decree calling for the elections is invalid. Yesterday the Cabinet of the Governor emitted a press release in which Governor Lucille George-Wout explains why she will not sign the current government’s National Decree postponing or canceling the National Decree that dissolves Parliament and calls for elections.